Can cause one to dream. 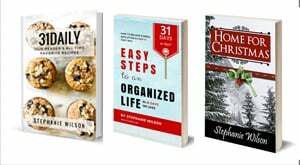 People moved a slower pace. 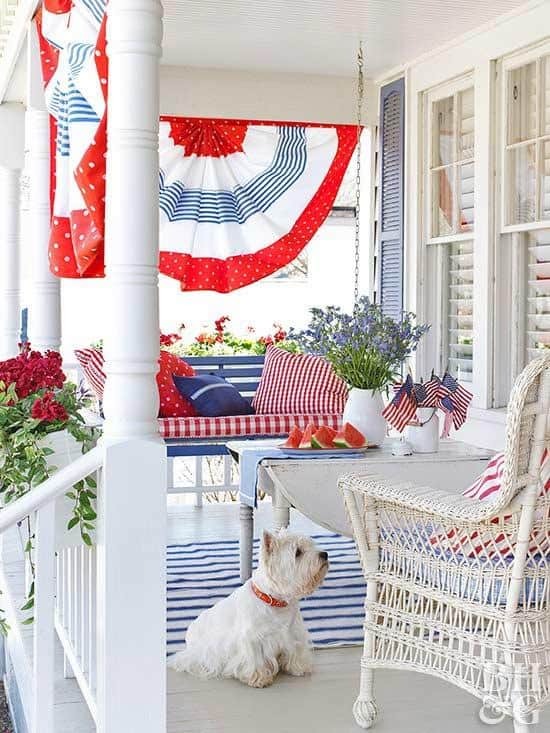 There is something just quintessentially summer about porches. 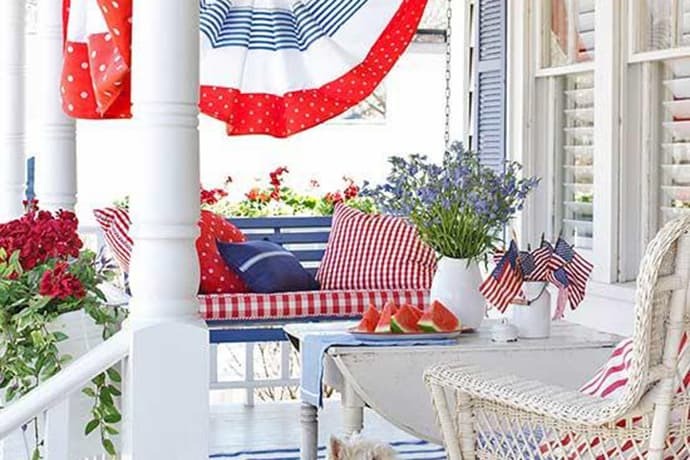 And if you add bunting, a flag, a vintage quilt, red geraniums, a summer read that you absolutely can’t put down, a soft breeze tickling your hair, a glass of Southern Sweet Tea — you have the summer of my dreams. 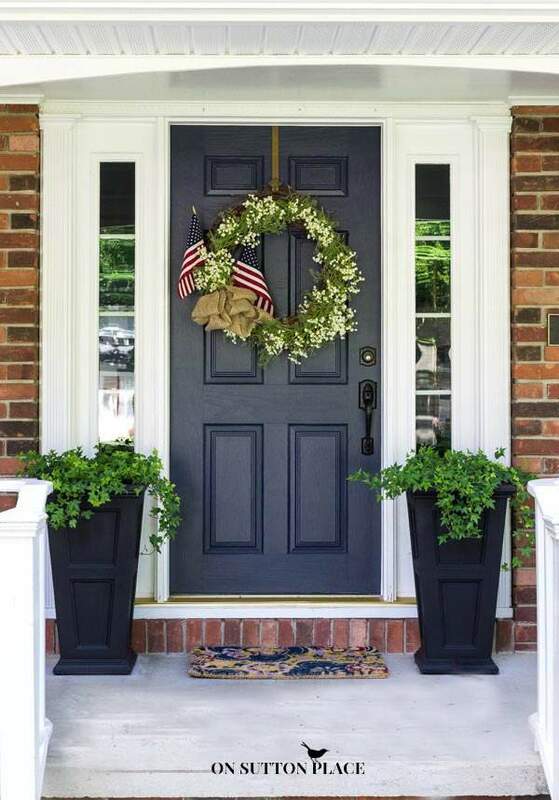 And while we may not all have a wonderfully wide, wrap-around front porch, we all have a front door, or a space where, in our creativity, we can make festive with something red, white, or blue. 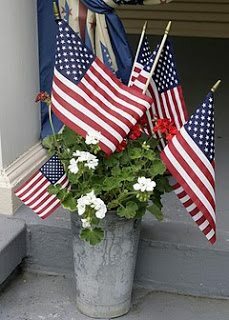 These colors that bind Americans, unify our spirits in a land of plenty and make our hearts happy, because after all — this is what we do in the summer. 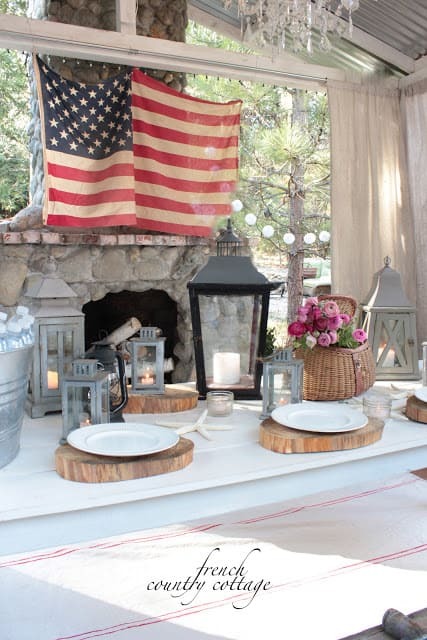 We gather and we celebrate — and very often, it’s with a backdrop of red, white and blue. 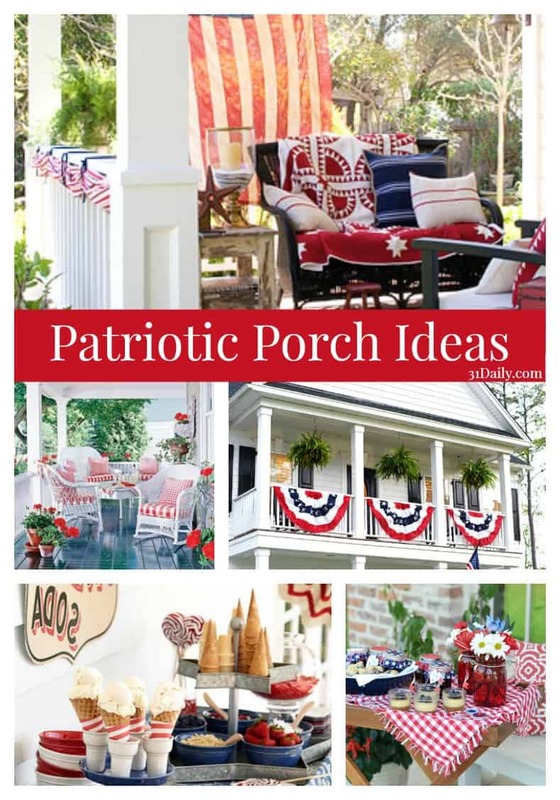 We’ve gathered some of most favorite finds across the internet to give you some ideas on how to decorate your space, show your patriotism, brighten up your front porch, walkway, door, patio, deck — and make it last all summer long! 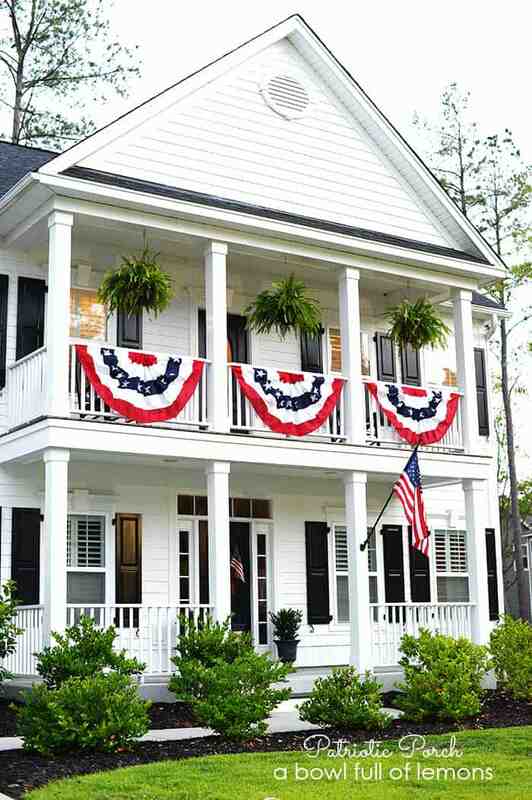 Isn’t there just something extraordinarily American and summer and festive when you pair white colonial homes with patriotic buntings and flags? I’ll never tire of seeing this traditional and classic design! 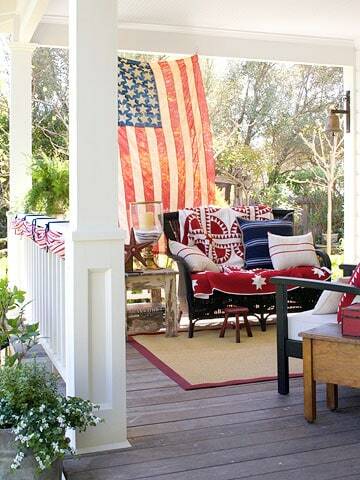 “Wave away the heat, and proclaim your allegiance, with these red, white, and blue decorations. With wooden garden markers as handles, our fans make great party favors…” and a welcome front porch to family, friends, and neighbors. I love the simplicity of this arrangement. 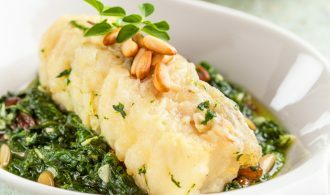 It’s festive and eye-catching and incredibly quick and easy! 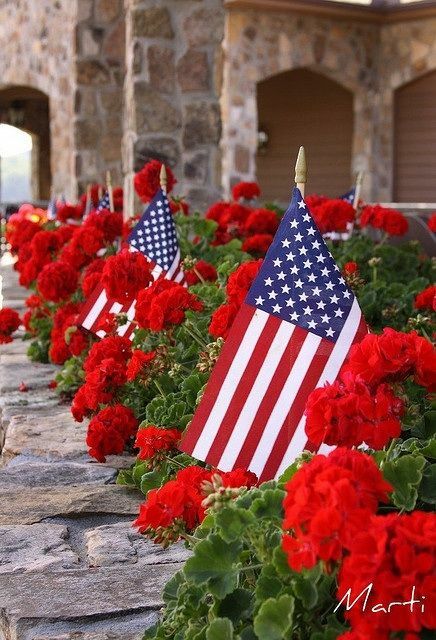 Red summer geraniums are so striking against a house or along a walkway. 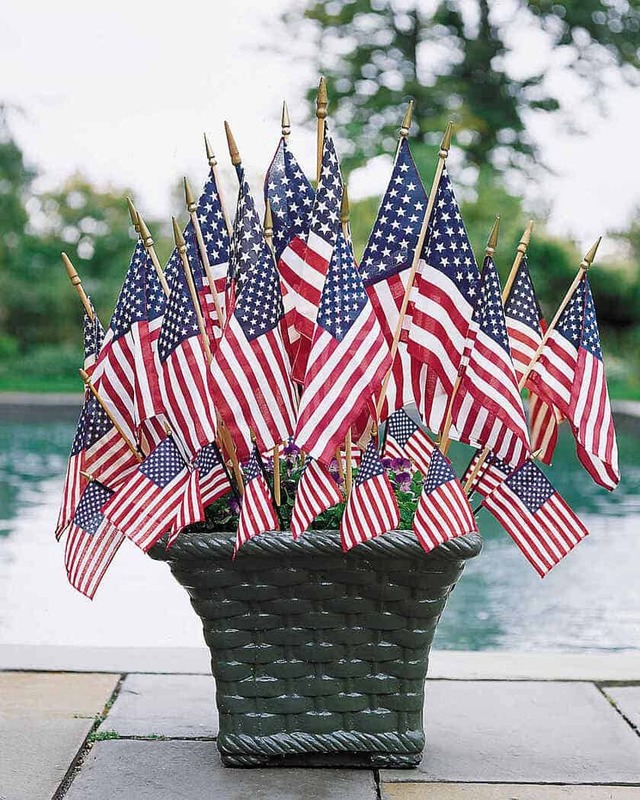 As July approaches, line the walk with flags and you have a stunning display! 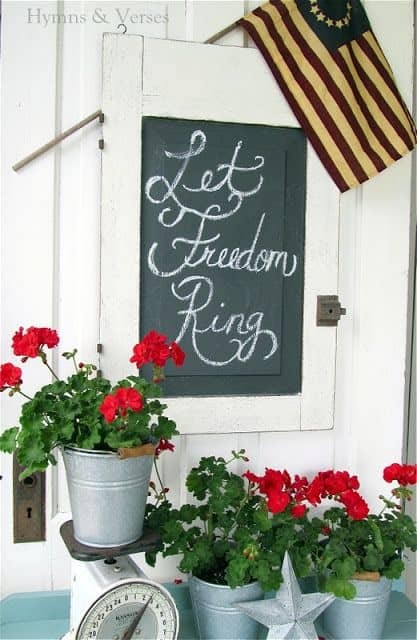 Decorating your front porch for the 4th can be as simple as adding a burlap bow and a couple of flags to a wreath you already have. Simple and understated, and gorgeous! I love decorating with quilts in the summer. 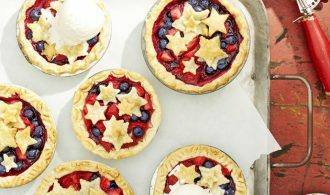 Traditional red and white quilts are incredibly vibrant in the summer. If your quilt is vintage or has great meaning, consider hanging it on a protected wall or draping it in a safe location that won’t get too much wear and tear. 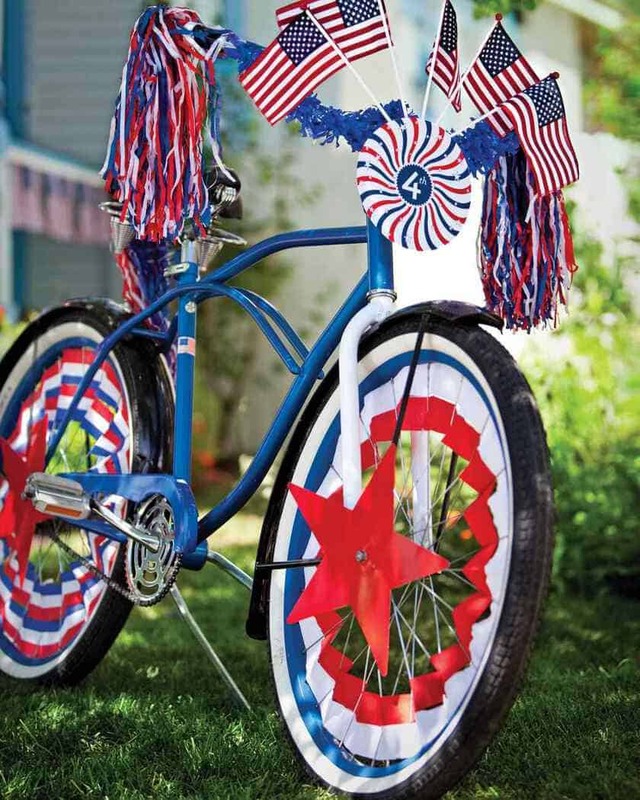 Perhaps you don’t have a porch to decorate, but how charming is this bicycle all decorated and waiting for the 4th of July parade? 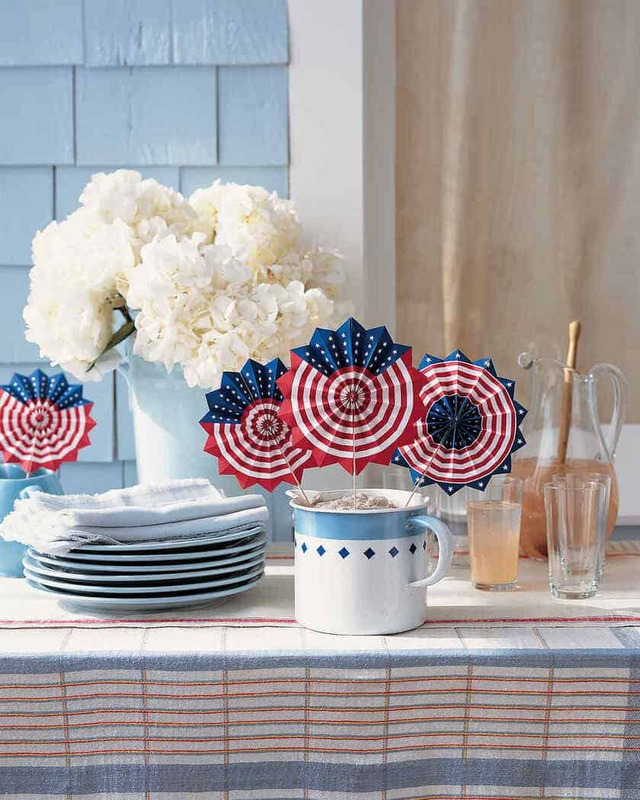 Make your own with templates from Martha Stewart. 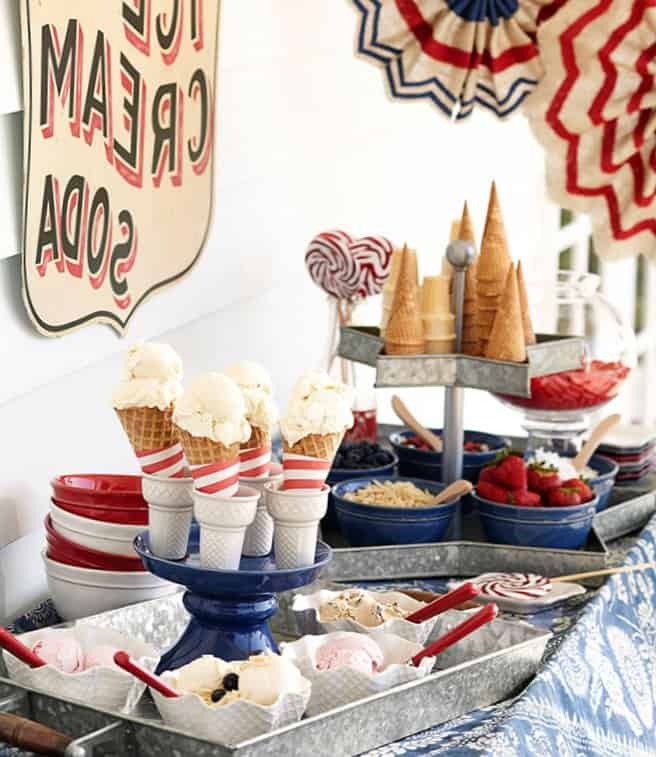 Such a charming and welcoming idea to set a tea tray on your porch or patio, serving patriotic sweets and treats. 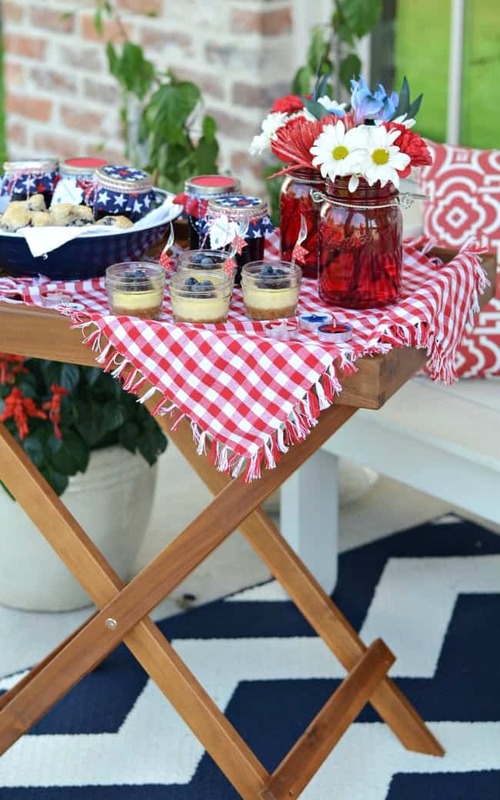 Perfect for mid-day activities or before a firework show. Of course, I’m imaging all kinds of delicious homemade ice cream. 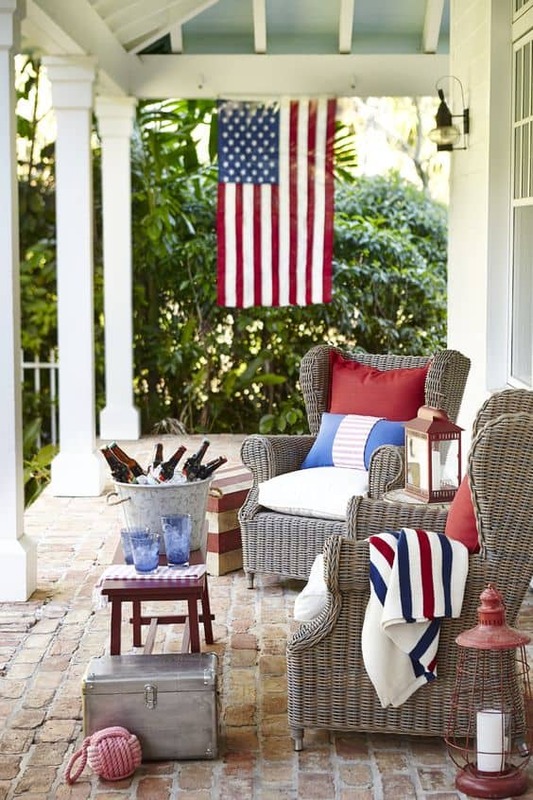 Courtesy of Pottery Barn — some great ideas to help you celebrate your American Summer! The bread basket of America. 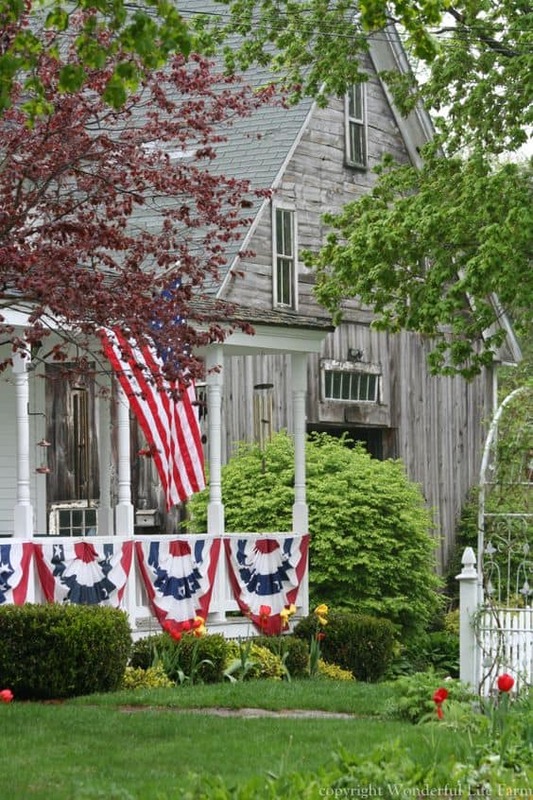 Farmhouse living, simplicity, whole and beautiful. Let us never forget the reason we celebrate our united states, united mission, and united freedom. America is an amazing place to call home.